Game of Thrones fans are crushed after learning that a casting announcement has killed hopes of a “beloved” character returning for season eight—debunking a popular fan theory that, while kind of fun and silly, does not compute. Watchers on the Wall has reported that German actor Marc Rissmann is joining the cast in Game of Thrones’ final season as a hotter, beefier version of Harry Strickland, whom A Song of Ice and Fire fans might recognize as the leader of the Golden Company mercenary group. This seemingly matches one of the bigger casting requests for a mercenary that would appear in two of the final season’s six episodes. 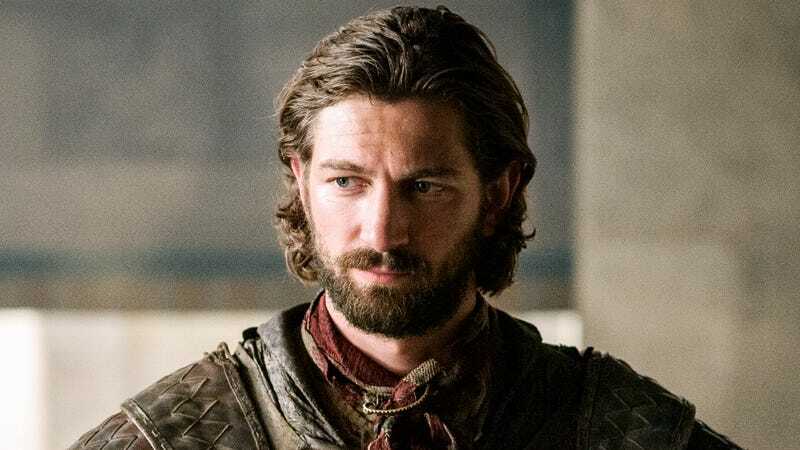 Unfortunately, this means that the secret leader of the mercenary group won’t be Dany’s former lover Daario Naharis (Michiel Huisman), a fan theory that has emerged in the past couple of months. The idea was that Daario, while pledging loyalty to Cersei Lannister, would be secretly working to help Daenerys take down the Lannister forces from the inside. Plus, it would give Daario something to do after he was abandoned at the end of season six. Only here’s the problem: Daario was never part of the Golden Company. Daario’s on the right, looking less bearded than usual. Daario Naharis was introduced (albeit as a different actor) in season three as a lieutenant in the Second Sons, a completely separate mercenary group that, at the time, was under the employ of Yunkai. Daario eventually killed the leaders of the mercenary group and took over, swearing his and his troops’ fealty to Dany. Last we saw them, they’d been left behind to keep the peace in Meereen. The Second Sons and the Golden Company are two completely different mercenary groups, with their own skills, demands, and power structures. Given their line of work, they’re very competitive, and it seems highly unlikely that they would merge forces—especially offscreen. At the very least, wouldn’t Daenerys have been informed that the only troops she had guarding Meereen jumped ship for another mercenary army? I’m guessing people were confusing Daario with Jorah Mormont, who actually was a member of the Golden Company (in the TV show only) before swearing allegiance to Dany’s brother Viserys. In any case, Daario’s probably never coming back, folks. He’ll most likely be wandering the streets of Meereen forever. Get over it.